Turkey's top football flight may not be receiving the media coverage that big western European leagues enjoy, but it is one of the most followed championships in Europe, considering not only the country's vast football-crazy population, but also the millions and millions of Turks who live abroad, and make sure to be close to a TV set every weekend, to watch their beloved teams that make up the Süper Lig. Football has been played in Turkey since the last years of the 19th century, and city leagues started being organized in 1904, but the country got its first nation-wide championship in 1959, under the name “Milli Lig”. Only three cities were represented, Istanbul, Ankara, and Izmir, but it is considered the first national league season in Turkey, albeit a short one, one that started and ended in the same year, for the first and the last time. Fenerbahçe were the inaugural season's champions, even though Beşiktaş consider themselves Turkey's first champions, for winning back-to-back titles in the so-called “President's Cup” that was organized the two seasons before “Milli Lig” was established, a short-lived competition that was used to decide the team that would represent Turkey in UEFA's European Cup, today's Champions League. Fenerbahçe, Beşiktaş, and of course Galatasaray, have been the league's dominant forces, backed by millions of fans and occasionally strong political figures, or/and powerful businessmen/companies. Even today, it looks hard to believe that a team outside Istanbul, Trabzonspor, managed to win the title an incredible six times in ten years, from the mid seventies to the mid eighties. Less, but still impressive, is the fact that Bursaspor as well managed to break the Istanbul powerhouses' monopoly in 2010. Given how dominant the “Big Three” from Istanbul have been since the inaugural season of the league, it's no wonder that only five clubs have won the title. One thing that has changed though since the late fifties, is how representative of the whole country the league has become. From three cities in 1959, the Süper Lig (called like that since the 2001-02 season) has evolved to feature clubs from many more cities, usually 12 or 13, with Istanbul, the country's by far most populous city, still home to almost half a dozen clubs every season. Moreover, it's Istanbul's “Big Three” the only clubs that have never missed a season in the top flight, competing for the title in 1959 and every year since then. 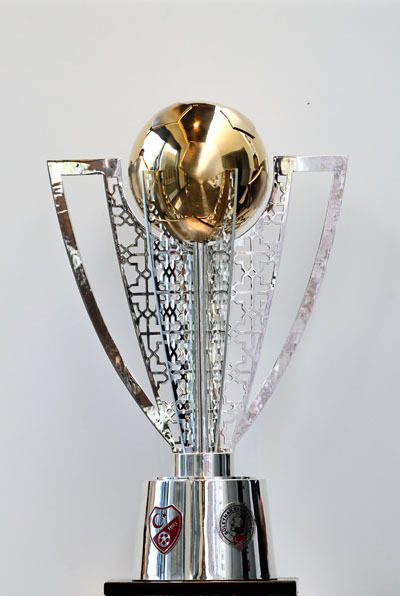 The latest Süper Lig trophy, given to the champions since 2015. Records and titles-aside, the Turkish Süper Lig stands out for another reason; the first years of the 21st century some clubs realized that investing in a new, modern, football-specific stadium was the way to go. Fast forward to these days, most clubs competing in the top flight, but also several smaller ones playing in the second category, can proud themselves of having truly impressive homes, with new ones getting delivered year in year out, putting new Turkish cities on the football map. Süper Lig is the top level of the Turkish football league system. The second division is since 2001 known as TFF 1. Lig (former Türkiye İkinci Futbol Ligi; in English: Turkish Second Football League). An overview of the current national league system is presented in the table below. Below the fourth tier the league is played on amateur level. Statistics of all Turkish clubs that have won the top league, concerning the period 1959-2017. Two of the titles won by Fenerbahçe are controversial, since they was won before the start of the Süper Lig and in the current Turkish Federation Cup, but has got official status by the Turkish Football Federation. Statistics of the Turkish clubs that have participated most times in the top league during the period 1959-2017. The table shows the capacity of the teams participating in Süper Lig. The average capacity in the league is 28,613. The league's all-time leading goalscorer is internationally famous Hakan Şükür. He scored 249 goals in 489 appearances, most of those playing for Galatasaray, but also Sakaryaspor and Bursaspor, in his late teens and early twenties, before moving to “Galata” in 1992, aged 21. Şükür broke Tanju Çolak's record of 240 goals in 2007. It's interesting to note though that Çolak scored his 240 goals in just 282 matches, and he is the only Turkish player to have won the “Golden Boot”, for his 39-goal tally in 1987-88. “Bay Gol”, “Mr Goal”, as he was called during his time at Samsunspor, Galatasaray and Fenerbahçe, was obliged to retire aged just 31, in 1994, after only one season at Istanbulspor. Hard as it may be to believe, he was sent to prison for smuggling a luxury car into the country. Şükür is also third in league appearances, 489, five less than Rıza Çalımbay. Both of them are looking at Oğuz Çetin's back in the list. Having worn the jersey of Sakaryaspor and Fenerbahçe for most of his 19-year career, Çetin retired in 2000, having played in 503 games. Other notable top scorers that have scored more than 200 times in the league are Tanju Çolak, Hami Mandirali, Metin Oktay and Aykut Kocaman.